Book Review by Christina Coleman (part of the TAP In series of guest reviews). I really enjoyed this book, it was creative and cute. It had nice pictures, the concept was understandable and held my attention. The book was about a cat named Chester that is self centered and rude, and takes over the author Melanie Watt's book. He re-writes the book with a red marker and doodles on it too. He really just wants the story to be about him and not about what she's writing about. Also kids will enjoy a laugh. What I liked about the book, was that the author was having problems with her own character, and really couldn't handle him. There was nothing that I didn't like about the book. I recommend this book to young kids ages 7- 10 years of age. Also this book would be great as a read aloud and a read alone book. Note from Alysa: Hmm, a character who takes over your projects, doodles on things with red markers, and wants everything to be about him? Sounds like parents of toddlers will enjoy a laugh, too! I'll definitely pick this one up soon. I love the artwork for this book. The cover is so cute! 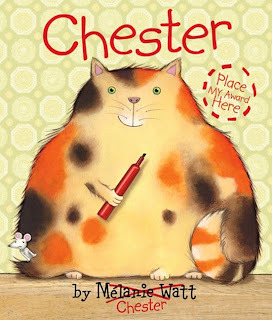 The Chester books are some of my favorites. They're so clever.